We’d love your help. Let us know what’s wrong with this preview of R Is for Rocket by Ray Bradbury. literally scream to get out. To ask other readers questions about R Is for Rocket, please sign up. A lovely thin hardcover with illustrations lived in my room through my childhood and teenage years. At least once a year I would revisit 'R is for Rocket', again and again listening to the forlonrn blare of the preshistoric monster from the deep, fly in Bodoni's virtual rocket, pop 'food pills' and race to the local space-port to watch rockets blast off. Some day I'll try to pay my respects by writing fiction in which people travel through space in rockets, it rains on Venus, Mars has crumbling A lovely thin hardcover with illustrations lived in my room through my childhood and teenage years. At least once a year I would revisit 'R is for Rocket', again and again listening to the forlonrn blare of the preshistoric monster from the deep, fly in Bodoni's virtual rocket, pop 'food pills' and race to the local space-port to watch rockets blast off. Some day I'll try to pay my respects by writing fiction in which people travel through space in rockets, it rains on Venus, Mars has crumbling crystal cities, and boys dream of flying through space. But this can only happen when I feel ready. Maybe when I'm 120. Leave me with any Ray Bradbury book, and it will quickly be devoured it short, neat order. You're never sure what you're going with Bradbury. It might be fantasy, it might be sci-fi, it might be a cute story about a boy getting a gift on Christmas. More often than not, it's a hybrid. But one thing's certain about his short story collections: you're going to get some duds. I avoided this particular collection for a long time because of the title. That was a dumb mistake I'd like to think I'll nev Leave me with any Ray Bradbury book, and it will quickly be devoured it short, neat order. You're never sure what you're going with Bradbury. It might be fantasy, it might be sci-fi, it might be a cute story about a boy getting a gift on Christmas. More often than not, it's a hybrid. But one thing's certain about his short story collections: you're going to get some duds. DREAMERS! BE ENCOURAGED. YOU ARE UNDERSTOOD. Ray Bradbury’s R is for Rocket is a book about and for dreamers… and those who truly desire to understand them. A common character type in his work is the wide-eyed, yearning dreamer who reaches too high, often for a dream beyond his capacity, and who inevitably teeters on the brink of success and failure. It’s no surprise that Bradbury produced so many pieces that gave voice to themes of blue skies since he himself was a dreamer, a voracious reader and DREAMERS! BE ENCOURAGED. YOU ARE UNDERSTOOD. It’s no surprise that Bradbury produced so many pieces that gave voice to themes of blue skies since he himself was a dreamer, a voracious reader and enthusiastic writer from an early age, a man who thrilled himself (and his fortunate readers) on the wild imaginings of his literary soul. In R is for Rocket, the story “The Rocket” is an excellent example of the author’s heartfelt kindness and sympathy for — and identification with — the hopes and heartaches of a dreamer, in this case one Fiorello Bodoni, a middle-aged, married-with-many-children man obsessed with dreams of rocket travel and space exploration in the face of those who are quick to discourage him. “I will ride up in one someday,” said Bodoni. “Perhaps my sons—” said Bodoni. The old man subsided, gazing at the river in which, drowned, images of rockets burned down the sky. “Sleep well,” said the other. This review was written by Kevin Polman, author of THE EXTRA KEY and STORIES. Before I tell you what I thought of this book, I should note that this is only my second Ray Bradbury book, after Fahrenheit 451. I really, really loved Fahrenheit too. This book was both good and bad, since it was full of short stories. 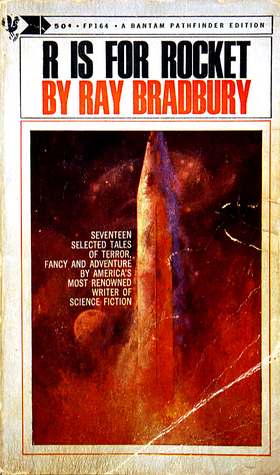 Seventeen short stories in all and most were science fiction, Bradbury's specialty. The Fog Horn - Loch Ness is in love with a foghorn. What is there not to like? The Long Rain - By far the most horrifying of all the stor Before I tell you what I thought of this book, I should note that this is only my second Ray Bradbury book, after Fahrenheit 451. I really, really loved Fahrenheit too. The Exiles - I thought of Fahrenheit 451 when I read this. I instantly loved it. Here There Be Tygers - My ultimate fantasy! The Sound of Summer Running - Bradbury's way of making you see how the boy felt was so powerful. Some of the stories are dated but the prose is not. If you loved the Martian Chronicles, you will love this book. So it turns out I just don't like Ray bradbury very much. I'm kinda surprised to realize it. I think it might be because he writes from the heart and I prefer stories of the head. There is a sentimentality to things like October Tree (and many of these stories) that means a lot to many people but feels contrived and cheesy to me. Where he does try to be clever (like Sound of Thunder or the Exiles) he falls well short. Many of these stories are about nuclear families where the dad loves rockets. So it turns out I just don't like Ray bradbury very much. I'm kinda surprised to realize it. I think it might be because he writes from the heart and I prefer stories of the head. There is a sentimentality to things like October Tree (and many of these stories) that means a lot to many people but feels contrived and cheesy to me. Where he does try to be clever (like Sound of Thunder or the Exiles) he falls well short. Ray Bradbury was my first "favorite author." I'm sure that's true for lots of people. There was a bookstore in Milwaukee, somewhere on the East Side, called Webster's Bookstore, the only bookstore during my childhood to have a special section just for dinosaur books. I pestered my father often to take me there, and sometimes he acquiesced, and I would slowly make my way through the shelf devoted to prehistoric things, trying to narrow down the collection to just one book I could ask my father to Ray Bradbury was my first "favorite author." One of those times the dinosaur book was "Dinosaur Tales" by Ray Bradbury. I remember debating between choosing that book or another, and later, on the way home in the car, I started to wonder if I'd made the wrong choice. (I no longer remember what the other book was I wanted, maybe one of the Greg Irons illustrated dinosaur coloring books.) That afternoon, back at home, my father took me on the deck in the shadow of our house, and read "A Sound of Thunder" to me. The William Stout illustrations were perfect, as was my father's reading, though I wished the Tyrannosaurus didn't have to die. The surprise ending did blow my mind, though, and I've probably reread that single story more times than I can remember. Some of it I have by heart. And when I write about dinosaurs today, "A Sound of Thunder" is always in my mind. As influential as that story was, I hadn't read much Bradbury in the past twenty years. New "favorite authors' came and went, and when I'd return to Bradbury I wasn't always happy with what I found. I'd been burned a bit by some of his later works that felt hackneyed and saccharine. My recent revisit of "Something Wicked This Way Comes" was not as magical as I'd hoped. But still, something about Bradbury is attractive. I love the lyricism, the way he plays with words, the awe that he expresses—and inspires—so effortlessly. So, I sat down with this book. It had some of the dinosaur stories in it—my precious "Sound of Thunder" and "The Fog Horn"—plus a number of scifi-ish things about rockets, and a couple tales about summer in Green Town. When Bradbury is good, he's amazing. I still was caught up in "A Sound of Thunder." "The Fog Horn" and "The Golden Apples of the Sun" were both equally beautiful and evocative. One of the longer stories, "Frost and Fire," had a very Edgar Rice Burroughs feel to it, with savage people lost on another world, running around naked, fighting, surviving; I enjoyed it. I didn't love everything, though. Sometimes his stories teetered too deep into sentimentality. "The Rocket," "The Strawberry Window," and "The Exiles" especially did not move me. But those were just three stories out of seventeen. I grew up fairly close to an air field. Close enough that some days, whilst walking out on the moors, my brother and I would pause and then crouch instinctively as the sky opened and giant metallic blades screamed through the air. 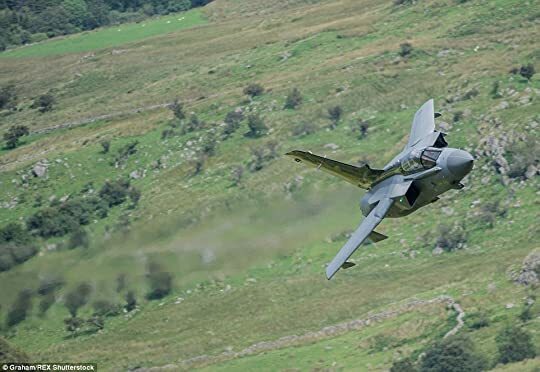 Too low to be legal, too high for us to see the pilot's face, close enough to feel the afterburn in our sternums and send us running over the grasses, shouting with joy. They weren't rockets, of course, but Tornado GR-4's, the wings swept, the enormous nose, the yawning I grew up fairly close to an air field. They weren't rockets, of course, but Tornado GR-4's, the wings swept, the enormous nose, the yawning air intakes. The kind of joy, exhilaration, that those engines stirred up in me and my brother is the joy that Bradbury captures in the eponymous story of the novel. That crazed joy, the hope that you can one day be a apart of it, feeling like you'll die if you're not. He got it just right. The rest of the collection does not disappoint either, I'm not sure if going through each story would have much merit but a couple that really stood out to me were The Fog Horn, the Golden Apples of the Sun, the Long Rain, and Here There Be Tygers. Each one is a very different take on marvel and exploration. The Fog Horn puts to mind The Willows by Algeron Blackwood. That same creeping unease is built u p, and I was lost in the suspense of it. Golden Apples, the Long Rain, and Here Be Tygers were more in the vein of a traditional space-faring exploration narrative but with a strong focus on charactization as well as world building. I thing what makes these stories so enjoyable to read though are how well they're put together. There is rarely any exposition, the reader is thrown right into the middle of the story, and much of the fun is figuring out what's going on. These are masterful tales and will be a great addition to my favoruites shelf. Read them to feel that joy of childhood, that thirst and passion for the beasts of technology that promise so much. Back when I first read both of them in high school, I used to think of Bradbury in the same breath as Asimov. Only now do I see the vast gulf that separates the two. Bradbury is actually a writer, whereas Asimov was mostly an idea man. In reading this short story collection, I'm struck by two things: a) the poetry of his words, and b) the sheer breadth of the subjects he broaches and tones he portrays. I never realized how versatile he was. A lot of his stuff is just bizarre (I'm talking about y Back when I first read both of them in high school, I used to think of Bradbury in the same breath as Asimov. Only now do I see the vast gulf that separates the two. Bradbury is actually a writer, whereas Asimov was mostly an idea man. In reading this short story collection, I'm struck by two things: a) the poetry of his words, and b) the sheer breadth of the subjects he broaches and tones he portrays. I never realized how versatile he was. A lot of his stuff is just bizarre (I'm talking about you, "Uncle Einar"), but it all deals with very real sentiments and very real human emotions of sadness, hope and nostalgia. I guess above all I would describe Bradbury as a nostalgic writer, which is ironic since he spent so much of his time writing about the future. My favorite stories in this collection are "A Sound of Thunder," "The Long Rain," the famous "Here There Be Tygers," and the lengthy "Frost and Fire." I was surprised particularly at the last one since it seems like a fairly juvenile, middle-schooly premise ("What if humans only lived for eight days? "), yet he makes it work by sheer force of passion. He begins the book with the weakest stories, IMO, mostly because they're marred by his stalwart faith in technology and the human pursuit of immortality. Only later in the collection does it become apparent that he is questioning this mindset, and he ends with two very earthy, non-scifi stories that deal only in pleasant feelings of childhood. After not reading Bradbury in a long time, I think I'm going to have to go revisit more of his stuff. I encourage you to do the same! I first read this collection in 7th grade. A few years ago, I bought all the beautiful hardbound reprints from PS Press and also from Subterranean Press. Bradbury stories deserve these editions and they glorify my bookshelves now. Tragically, we just lost a giant. Ray Bradbury has passed away. I grabbed this book and read it after hearing the news. There are great and famous stories here. The Foghorn....the story of a lighthouse foghorn singing its sad song....and calling up something from the de I first read this collection in 7th grade. A few years ago, I bought all the beautiful hardbound reprints from PS Press and also from Subterranean Press. Bradbury stories deserve these editions and they glorify my bookshelves now. Tragically, we just lost a giant. Ray Bradbury has passed away. I grabbed this book and read it after hearing the news. After decades of heavy reading came some years of reading nothing. It felt like there was nothing interesting to read, or that any book i should accept to read should necessarily change my perspective of life - this is easy when we are younger, but gets harder as the years go by. So for the first time in my life i grabbed a science fiction book and wow! What a wonderful experience. That book did not change my life, nor did it enhance my culture much - it just felt very good to read it. I was impre After decades of heavy reading came some years of reading nothing. So for the first time in my life i grabbed a science fiction book and wow! What a wonderful experience. That book did not change my life, nor did it enhance my culture much - it just felt very good to read it. I was impressed by the love that seemed to transpire in every word and by the amount of work behind it - every tale seemed to be forged with a healthy mixture of scientific rigor and a passionate desire to share a personal vision. It seems that science fiction allowed grown people to play again. Science opened up many playgrounds of possibilities where people's imagination could run free, without fear of sharing extravagant visions because scientific plausibility served as a respectful alibi. This is possibly the best book I've read all year. Maybe not technically brilliant, but its heart and soul more than made up for that. It's a collection of short stories written in the '40s and '50s and they are all wonderful. These are the sorts of stories that remind me why I love science fiction: not only do they evoke a sense of joy and wonder at the amazing universe we live in, but Bradbury's writing is poetic, gets under your skin and is a joy to read. The stories are true Golden Age stuff, This is possibly the best book I've read all year. Maybe not technically brilliant, but its heart and soul more than made up for that. It's a collection of short stories written in the '40s and '50s and they are all wonderful. These are the sorts of stories that remind me why I love science fiction: not only do they evoke a sense of joy and wonder at the amazing universe we live in, but Bradbury's writing is poetic, gets under your skin and is a joy to read. Ray Bradbury was one of my favorite authors growing up, and this collection reminded me why....but I also forgot how sad some of his stories could be, so not they aren't always a picker upper. But isn't that the best thing about short stories? You can move past one and then always go back to it later. The saddest story was "The Fog Horn" and the next saddest was "The Rocket Man"; and the most disturbing were the "The Long Rain" and "A Sound of Thunder"....my favorite and the most uplifting to me Ray Bradbury was one of my favorite authors growing up, and this collection reminded me why....but I also forgot how sad some of his stories could be, so not they aren't always a picker upper. But isn't that the best thing about short stories? You can move past one and then always go back to it later. The saddest story was "The Fog Horn" and the next saddest was "The Rocket Man"; and the most disturbing were the "The Long Rain" and "A Sound of Thunder"....my favorite and the most uplifting to me (and with the fastest pace) was "Frost and Fire". Yeah, this is a thing now. Bradbury before bedtime. And I continue to be thrilled by it even as I continue to not bother explaining in these five-star reviews precisely WHY you ought to read short stories by Ray Bradbury. Because I shouldn't have to. It's Ray Bradbury. You should know already that it's awesome and the approximate reasons why, even if you've yet to actually read any of his work. And; If you haven't read any of his work, hang your head in shame. Then go buy some of his work and rea Yeah, this is a thing now. Bradbury before bedtime. And I continue to be thrilled by it even as I continue to not bother explaining in these five-star reviews precisely WHY you ought to read short stories by Ray Bradbury. Because I shouldn't have to. It's Ray Bradbury. You should know already that it's awesome and the approximate reasons why, even if you've yet to actually read any of his work. Farewell summer, Ray Bradbury. Got the news just as I finished reading this book. I spent much of 2018 rereading old favorites. This was partly due to time demands and I couldn't devote myself to reading as much as I wanted. Reading something I read decades ago fit into that kind of schedule. But, also, it is a great joy to rediscover stories you enjoyed years ago. Anything by Ray Bradbury is a wonderful adventure and he was one of my all-time favorites. I eventually ran out of new material to read and his books were consigned to the book shelf as old friends. It's been long I spent much of 2018 rereading old favorites. This was partly due to time demands and I couldn't devote myself to reading as much as I wanted. Reading something I read decades ago fit into that kind of schedule. But, also, it is a great joy to rediscover stories you enjoyed years ago. Anything by Ray Bradbury is a wonderful adventure and he was one of my all-time favorites. I eventually ran out of new material to read and his books were consigned to the book shelf as old friends. It's been long enough that many of the rereads seemed fresh. Books like The Martian Chronicles, and Something Wicked This Way Comes are just about as good as it gets when it comes to pulling the reader into the story. In my opinion, this was Bradbury's gift. I always felt his prose excelled as much as any I've ever read anywhere in making me live the story instead of merely reading it. R is for Rocket, and the follow-on S is for Space (which I also review), both present a series of stories. Some are Bradbury's hallmark stories of space travel, life on other planets, and stories of the macabre. But, Bradbury also excelled at stories of the human-nature, could happen anywhere type that are just as enchanting. Stories in 'R' that fit that description include The Time Machine and the The Sound of Summer Running. Even the The Rocket, set in a future with routine rocket travel, is a fine human-interest type. There are also plenty of the more traditional Bradbury, including the exceptional Fire and Ice and The Dragon. I never fail to be amazed at just how GOOD Bradbury was. He was a poet of the human spirit in a way few writers could match. He remembers what it was like to be young and full of energy and wonder, and he knows/anticipates what it's like to grow old. Most of the stories in this book are only superficially science fiction/fantasy; he just prefers to use those platforms to explore the human heart. It's important to keep in mind that these stories were written in the 1950's, when our knowledge of th I never fail to be amazed at just how GOOD Bradbury was. He was a poet of the human spirit in a way few writers could match. He remembers what it was like to be young and full of energy and wonder, and he knows/anticipates what it's like to grow old. Most of the stories in this book are only superficially science fiction/fantasy; he just prefers to use those platforms to explore the human heart. It's important to keep in mind that these stories were written in the 1950's, when our knowledge of the universe was a fraction of what it is now, so you just have to put up with Venusian jungles and retrieving a scoop of the sun. They're trifling elements, anyway, and if you focus on scientific accuracy, you'll be missing the point. It'd be like being upset that Frankenstein is based around reanimating a corpse with lightning. What I love best about this collection is that he can go from (beautifully written) golly-gee-whiz sentimentality to creepy darkness with the flick of a pen (an ability best seen, probably, in Something Wicked This Way Comes). A typical story has its head in the clouds and its feet firmly planted on the ground. Wonderful. Some of the stories here are Bradbury's best, it's a really good read that keeps you in a nostalgia bubble. This review has been hidden because it contains spoilers. To view it, click here. Found this lovely old beat up mass market paperback at a warehouse sale. I threw it in my bag for practically free. It is the perfect little book to put in my work bag to read on breaks. There are 17 individual stories, where each one can easily be read over a lunch break. There is plenty of value of keeping the little book around to re-read the stories. They are varied and touch most of the different kind of sci-fi and fantasy realms. "King of the Gray Spaces" ("R is for Rocket") (Famous Fantastic Mysteries, December 1943) - 18-page short story. This early Bradbury story is not so much a story as it is a sentimental musing, filled with lyrical word pictures. It packs an emotional punch that speaks to me as I was also once a boy longing to take flight on a rocket to the stars (and achieved that dream by becoming a rocket engineer). This story definitely belongs on the Retro Hugo ballot, and it won't surprise me if it wins. This is the third collection of stories by Ray Bradbury that I have read, the first two being different editions of The Illustrated Man. This collection of stories is another example of Bradbury's mastery of writing excellent space-age science fiction. Some highlights of this book (excluding those I've previously read from The Illustrated Man) for me are: The Rocket, The Strawberry Window, and Frost and Fire. Sólo he leído cuatro de Bradburu : los obligados Farenheit 451 y Crónicas marcianas, Tres x infinito y este. Y esos otros tres una gozada. Este no está mal para ser relatos cortos. Some of these stories have stayed with me nearly 40 years. Great to meet them again. Others I doubt meant as much to me at that age as they do now, especially the last story, about a pair of sneakers in a shop window, but really about boyhood. Once again Bradbury never disappoints with writing another great collection of short stories. Best Stories: The Fog Horn, The Rocket, The Rocket Man, A Sound of Thunder, The Long Rain, The Exiles, Frost, and Fire. Filled to bursting with that SF Sense of Wonder. A classic. Read it!